The latest episode of Boruto: Naruto Next Generations brought the Mitsuki Disappearance arc to an end with a big battle with the Fabrication Ku, and with Team 7 reformed, fans saw many techniques in use that they have not been able to see with Boruto, Sarada, and Mitsuki separated through the arc. 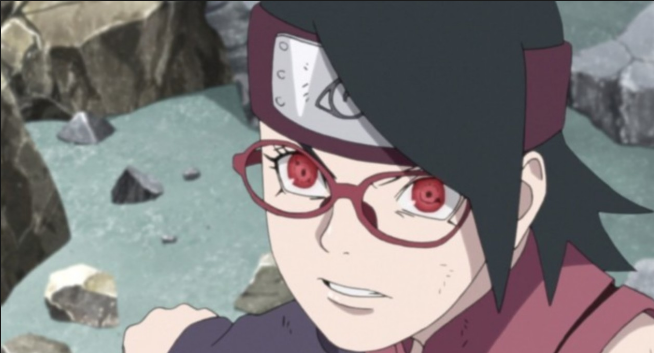 But one particular moment with Sarada has sparked a debate online as fans are now wondering whether or not Sarada has activated the second toe of her Sharingan or if it was an animation mistake. You can see the shot in question below. Sarada briefly activates her Sharingan in the battle. For a brief moment, it appears as if the second tomoe has activated in her eye but when she's shown from a different angle it's gone. Fans are taking this to mean that it might have been an animation mistake considering it's not highlighted, and which gone in the next shot. This most likely is the case considering that something as momentous as Sarada reaching the next level of her Sharingan would be a big deal in the series. It would not be a good idea to just shove it into a finale with so much going on for Mitsuki and the other characters, so it that's probably not the case here. Then again, it could be a hint for future events in the series. If it's the second tomoe activated, then it will leave the series room to explore it at a later date once the Mitsuki Disappearance arc is resolved.